With the weather heating up recently all I’m craving are lighter and fresher meals (well, most of the time!). 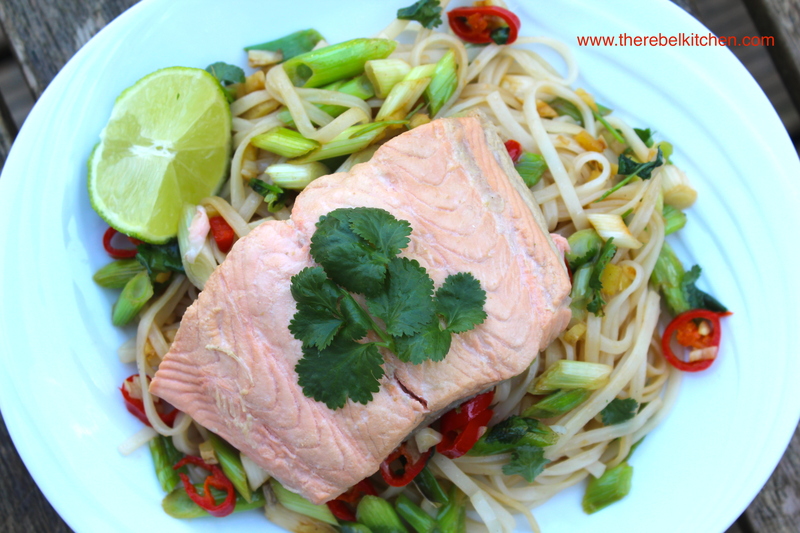 This poached salmon and rice noodle salad is so unbelievably tasty, yet still light and healthy. I have pretty full on psoriasis and eczema on my hands, so I’m becoming much more conscious of what I eat at the moment and am trying to boost my Omega 3 intake by eating more oily fish. Thankfully this recipe can be whipped up in 10-15 minutes and is as nice cold as it is hot, so it makes eating more salmon very easy. So easy in fact, that I’ve been making this every week (when I fall for a new recipe, I fall hard!). 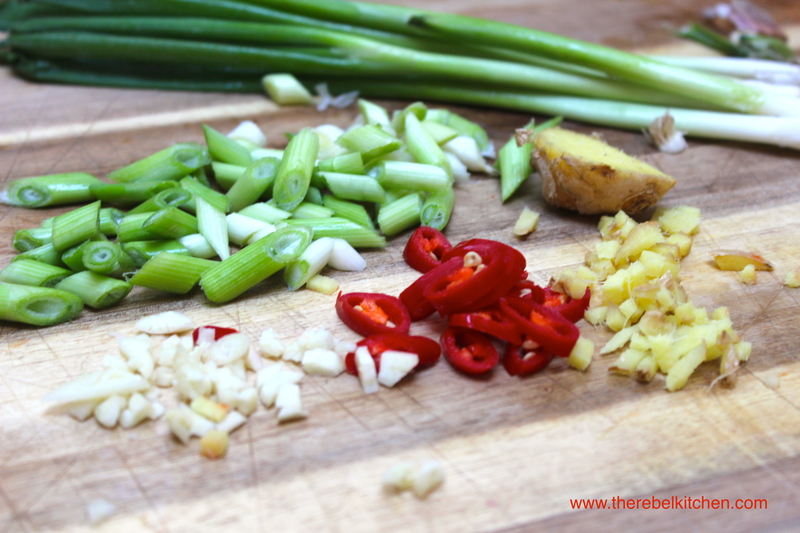 The zingy lime, ginger, garlic and chilli gives it a nice kick, and despite being a nutritional powerhouse, this recipe really feels like a treat! 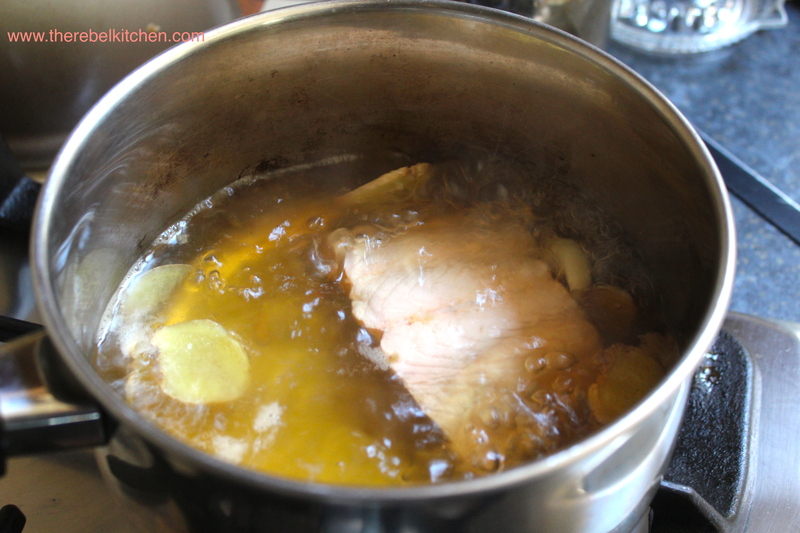 Half fill a pot with boiling water. 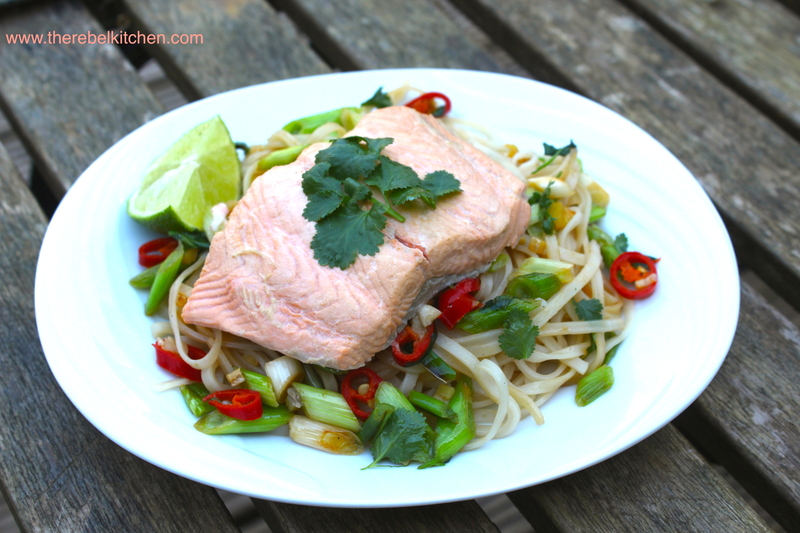 Add in about 2 tbsp soy sauce, the juice of half a lime, 2 crushed garlic cloves and 3-4 slices of fresh ginger, let it boil away for a few minutes before adding your salmon fillet. The salmon will take between 10-15 minutes to cook so keep an eye on it. 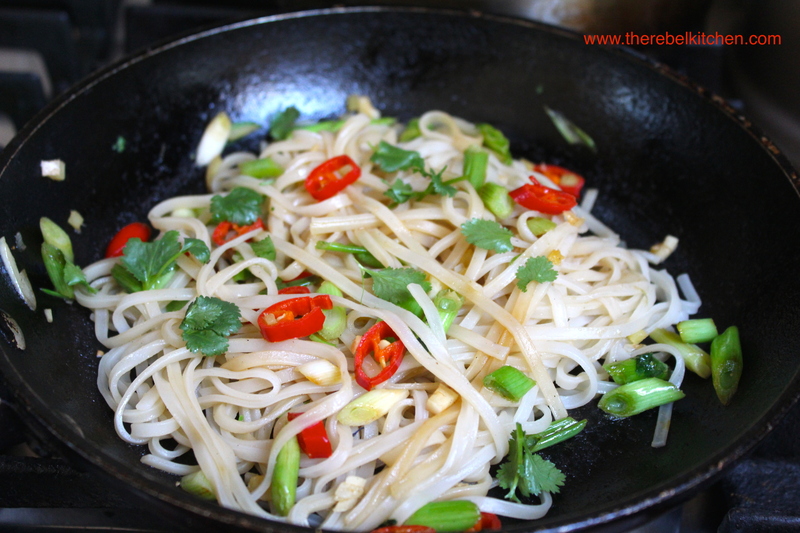 Your rice noodles should only take about 5-10 minutes to cook, but check the packet instructions to be sure. You want them to be cooked just before your salmon. 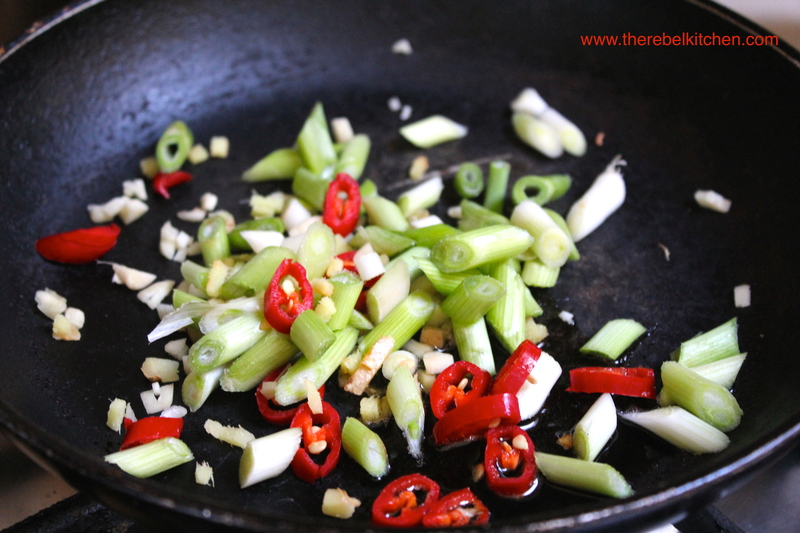 Slice the spring onions and chilli diagonally, finely chop the ginger and finely dice a few slices of fresh ginger. All them all to a medium heat frying pan with a tablespoon of toasted sesame oil. The toasted sesame oil will give this a delicious, nutty tasty. Fry for about 2-3 minutes. You don’t want these to go totally soft. When the rice noodles are cooked, drain them (reserving a few tablespoons of cooking water) and add them to the pan of veggies. Stir them in with a few tablespoons of soy sauce, a squeeze of lime juice, about a tablespoon of chopped coriander and some of the reserved cooking water if needed to loosen the mix out. This looks so good! Simple and healthy! Perfection. A very elegant looking bit of fish. Nice. Thanks Conor, it looked a lot less elegant once I started to dig in!